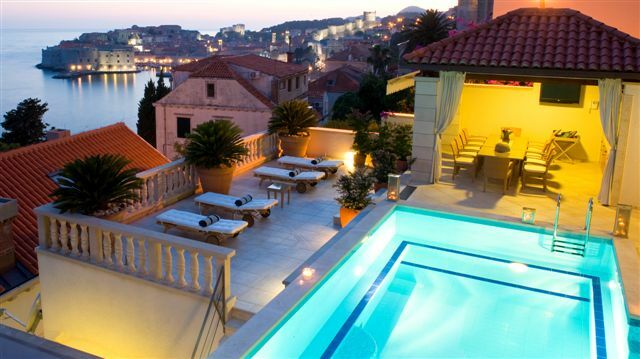 It offers you retreat, tranquillity and privacy whilst at the same time, history, culture and urban verve given that it is only 3 km away from the medieval city of Dubrovnik, listed under UNESCO World Heritage. It benefits from a wonderful and unobstructed view of the sea from almost every room utilized with large glass constructions of the villa, partially covered terrace with the outdoor pool and the private beach. Located 4.5 km from the Old Town and 900 metres from the shops. This modern designed Villa is newly build at the attractive location next to the sea front and incorporated with the landscape. The white stone walls, pure lines, floor-to-ceiling window fronts, wooden interiors breathe the spirit of the Mediterranean. The villa is built on several levels and it is completely opened towards the sea in a way that gives the comfort of the home and experience of nature simultaneously. The entire living space is full of natural light which enhances the warmth of wooden interiors. The entrance is on the top floor below the street side parking area which is separated by a stone staircase. The living area is arranged into split levels which intersect each other. Villa Mare Dea has floor heating throughout the complete living area and a “smart home” remote control system for the regulation of the temperature and adjustments of lights. The first level is consisted of the master bedroom with the en-suite bathroom and dressing room, two sea view double bedrooms with bathrooms and the access to the front terrace, one double bedroom with bathroom and the study area with a plasma TV. The ground floor benefits from the spacious living and dining rooms which have a direct connection with the outside terrace and the outdoor pool.